As I often note, a weekly blog is not a good place to cover breaking news. We’re still figuring out what happened yesterday in Baton Rouge, and the first details that come out in such situations often have to be revised later. Watch the Wikipedia page for developments. In both Baton Rouge and Dallas, though, it looks like the shooters are black veterans of the Iraq or Afghanistan wars. Who knows if this was really their thought process, but it’s not hard to imagine one: If you’ve been trained to solve problems with violence, what are you going to do when you see your people being killed and the system failing to call anyone to account? Assigning Johnson’s or Gavin Long’s guilt to the entire Black Lives Matter movement would a similar mistake. BLM is not about killing police or killing whites; it never has been. BLM is a response to a society that seems not to value black lives. Police killings are only a piece of that story: Across the board, problems are taken less seriously if they mainly affect blacks. The egregious cases we’ve been seeing, of police killing black men on video and facing no consequences — matching stories that have been told in the black community for decades, but which were discounted by whites because there was no evidence (beyond the testimony of other blacks) — are simply the clearest examples of that larger issue. Refusing to assign and punish collective guilt, though, doesn’t mean that we have to ignore systemic problems. Individual police around the country are not responsible for killing Alton Sterling, and anyone who attempts to punish them for it is expanding the problem rather than solving it. But there is a systemic problem in the way that American police departments deal with blacks, particularly young black men. There is also a problem with the tendency of police to cover up the wrong-doing of other police rather than uphold high standards. Pressure to reform the way police departments work from coast to coast should not stop just because two individuals carried out collective vengeance. Samaritan Lives Matter, where the example of Jesus’s most famous parable illustrates why “All lives matter” isn’t the right slogan. Rich Lowry’s False Choice, the false choice being that black communities can either have the current overly violent, racially biased kind of policing, or no policing at all. Why BLM protesters can’t behave, the answer being that the rest of us ignore them when they make their case politely. A post that doesn’t specifically mention BLM, but is still relevant, is “My Racial Blind Spots“. Hard to believe this attack, where 85 people were killed and 303 injured by a man driving a truck, happened on Thursday. So much has happened since. Am I the only one who sees the similarity between this and Stephen King’s novel Mr. Mercedes? I have come here to make it as clear as possible why I am endorsing Hillary Clinton and why she must become our next president. Secretary Clinton has won the Democratic nomination and I congratulate her for that. … I intend to do everything I can to make certain she will be the next president of the United States. The preliminary schedule for next week’s Democratic Convention has Bernie speaking on Monday. Since that’s more or less what I predicted — not because I’m so brilliant, but because the experts I’ve been reading had already reached similar conclusions months ago — I am not scrambling to explain how Comey could possibly have made this decision. However, pundits inside the conservative bubble (and many Sanders supporters who had latched onto conservative-bubble accounts to feed a desperate hope that Clinton might not be nominated) were shocked by this outcome, because they had concluded long ago that Clinton should be in jail and that Comey was exactly the kind of upright investigator to put her there. Unable to say, “I guess I had that wrong”, they came up with a number of creative theories about the corruption of Comey and Attorney General Loretta Lynch and President Obama, or about what other considerations could have motivated Comey’s actions. This kind of thing has happened before: In the closing weeks of the 2012 election, dwellers inside the conservative bubble decided that the polls were all skewed, and so a Romney victory — nay, a landslide — was at hand. When reality reared its ugly head, conspiratorial explanations were required, like massive vote fraud in multiple swing states (most of which had Republican governors) that somehow produced no evidence other than Obama’s victory. But instead of stretching to explain the failure of reality to live up to their expectations, surprised people might do better to consider the question raised by Ollie Garky on Daily Kos (later picked up by AlterNet): If events keep surprising me, shouldn’t I change my news sources? Back in 2013, Conor Friedersdorf suggested this criterion for comparing news sources: Who best equipped readers to anticipate the outcome that actually happened? The Comey announcement does seem to have knocked Clinton down in the polls, so that in some polls the race is even now. (538’s weighted average still has her with a 3.6% lead.) I’m expecting that dip to be temporary, but we’ll see. My comments about Mike Pence have been spun off into a separate article. A related topic is the ill-fated TP logo, which was inserted into the public discussion and then prematurely withdrawn about 24 hours later. Not only does the TP bring toilet paper to mind, but the penetration imagery was a little too suggestive. As she so often does, Samantha Bee took it all the way with an animated breaking-the-mattress GIF. More seriously, there is the Republican platform, which TPM describes as defining “the party of Kris Kobach“. McCain and Romney tried to soften the hard-right positions of the base in order to make a better appeal to the general electorate, but the Trump campaign has gone all-in on the red-meat issues. which apparently failed. Most Americans think of Turkey as a country way over there that has little to do with us. But if Islam is going to find a synthesis between its religious traditions and Western secular values of democracy and human rights, Turkey is the most likely place for it to happen. If democracy is not going well there, it’s a very bad sign for the world. It’s also hard to say whether the failure of the coup is good or bad for Turkish democracy in the long run. President Erdogan has been getting increasingly autocratic, but a military junta might have been worse. President Tayyip Erdogan is taking advantage of the failed coup against him to purge the judiciary and security forces of anyone who is lukewarm toward or actively critical of him. the intelligence community worked from the start on the misguided assumption that Saddam had WMDs and made no attempt to consider the possibility that he had got rid of them, which he had. The report finds that there was no imminent threat from Saddam Hussein, and that Prime Minister Tony Blair intentionally exaggerated the evidence that there was. Eight months before the invasion, when there were still many options other than war, Blair promised President Bush “I will be with you, whatever.” The invasion began with essentially no plan for putting Iraq back together. We can only wonder what a similar investigation into the Bush administration would find. But Congress has been unable to squeeze such a probe into its tightly packed schedule of eight Benghazi investigations. When somebody called for a moment of silence to this maniac that shot the five police, you just see what’s going on. It’s a very, very sad situation. The other night you had 11 cities potentially in a blow-up stage,” he said. “Marches all over the United States—and tough marches. Anger. Hatred. Hatred! Started by a maniac! And some people ask for a moment of silence for him. For the killer! Given Trump’s record, it probably won’t shock you to learn that the event he is talking about never happened: No one called for a moment of silence to honor Dallas cop-killer Micah Johnson. But it’s worse than that: No one — including his campaign — can even explain where he got the idea. To all appearances, he just made it up. Why would somebody do that? And then to imply that the BLM marches were “started by a maniac”, as if Johnson were a central figure in the Black Lives Matter movement, or the post-Dallas marches were intended to carry on his work (when in fact all public statements by march organizers denounced the killings) … why would anybody make up a Big Lie that incendiary? These are the words – the big lies rumbling the ground for some sort of apocalyptic race war – of a dangerous authoritarian personality who is either personally deeply imbued with racist rage or cynically uses that animus and race hatred to achieve political ends. In either case, they are the words of a deeply dangerous individual the likes of whom has seldom been so close to achieving executive power in America. Ark Encounter, the Kentucky theme park that presents Noah’s flood as a historical event, is back in the news. Ken Hamm, who is behind both the Ark and the Creation Museum, struck back by offering reduced admission to public school groups. We’ll see if anybody takes him up on it, and what court cases result. 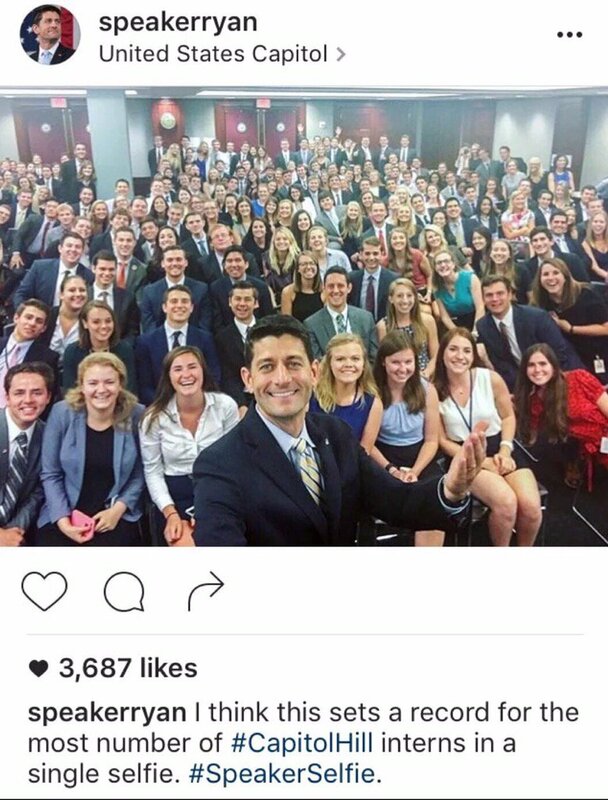 Paul Ryan had his picture taken with the Republican interns of the House. Did you ever see so many white people in your entire life? Time-lapse video of how storms form and move. I say, I was/still am a Sanders supporter who never concluded she should be in jail, or that she had in fact violated any laws at all. Yet I believe that THE REST of what he had to say about her actions confirms beyond a shadow of a doubt that she is not fit to be president. Unfortunately for you, Hillary will be the Democratic nominee for POTUS. Given the choice between Clinton and Trump – no third-party candidate will even make a dent in the voting – which one would you rather see win the election? As the old axiom goes, “perfect is the enemy of good”, and Clinton is as good a candidate as we’re going to get. I may not like her voting record and her hawkishness vis-á-vis military action, but I’m pragmatic enough to recognize that a Hillary presidency would be far less damaging to the country than a Trump presidency. (Assuming Trump wins the election and doesn’t bow out of actually becoming President, that is.) That may not be a convincing argument for Clinton, but at this rate, I’ll define it as “voting against Trump” and run with it. If Trump were to win my state and I didn’t cast a vote because I don’t like either candidate, I may as well have voted for him. I will not – cannot – let that be the case. If he wins my state, he will do so in spite of my voting against him. Which leaves you with exactly who to support for president in 2016? I thought that was pretty clear. The poster is voting against Trump. Therefore voting for Clinton, because she’s the only candidate that has any hope of beating him. “…but the Trump campaign has gone all-in on the red-meat issues.” OK, another teensy request. I dislike the use of the words “red meat” to describe issues that get the right wing motivated. I realize that it comes from the idea that when you bring raw red meat, you can get lions in the zoo to roar. However, red meat is actually a nutritious substance, and it makes “red meat” issues sound like issues of substance, ones that really matter. A better comparison would be to crack cocaine or crystal meth. That is, substances of no social value that make people act crazy. And calling them “crack cocaine” issues just describes the situation better.